56. Hesed Chana shares a building with a JDC Jewish community center. 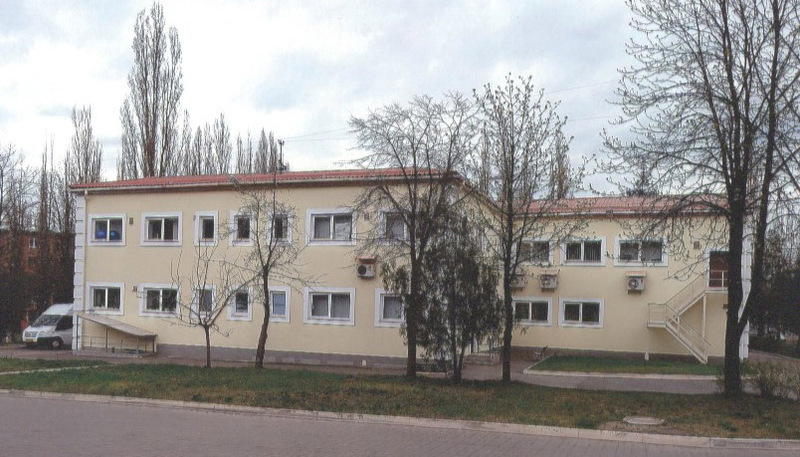 Vyecheslav Botvinnik, director of JDC operations in the city, stated that the hesed serves 1,700 clients, almost all of them elderly, in Krivoi Rog and 39 smaller population centers in the periphery. In some of these smaller locales, only one or two Jews remain. About 180 of these clients receive homecare services; many of these housebound individuals are very isolated and lonely said Mr. Botvinnik. Their only visitors are the homecare workers. Notwithstanding his severe mien, Vyecheskav Botvinnik is eager to explain JDC operations in Krivoi Rog and environs to visitors. Hesed Chana operates a day center for mobile seniors, scheduling each of six groups of 20 individuals for a full day of activities once every two weeks. Hesed vans visit 24 different places to pick up and drop off participants, Mr. Botvinnik said. As is the case in other cities and towns, the number of Holocaust victims continues to decline and revenue from the Conference on Jewish Material Claims against Germany has diminished accordingly. Some years ago, Mr. Botvinnik stated, 70 percent of all hesed clients were Holocaust victims; now only 40 percent of clients share that history. In addition to elderly clients, the hesed also attempts to assist disabled Jewish children through its Tikvah program, although it can offer only limited programs, such as speech therapy, to about 20 special needs youngsters who live in the city. With assistance of World Jewish Relief, a British organization, it brings these youngsters to the hesed for periodic assistance. Additional Jewish children with disabilities reside in the periphery, Mr. Botvinnik stated, but it is too difficult and too costly to provide them with services other than occasional food parcels and some financial support for medical needs. Local governments, including the municipality of Krivoi Rog, are insensitive to the needs of disabled people, continued Mr. Botvinnik. Schools are inaccessible to children who use walkers or wheelchairs; stores and other buildings are not designed with access ramps. The industrial base of Krivoi Rog contributes to a very unhealthy environment, Mr. Botvinnik stated. The quality of both air and water is poor, leading to chronic health conditions. Wealthy people, he continued, move away. The local steel industry is old-fashioned and many mills have closed. Mines have been depleted. The unemployment level is very high, and many individuals who are nominally employed work only part time. The JDC hesed and JCC building in Krivoi Rog is surrounded by a high security wall not visible in the adjacent photo. A formidable entry gate awaits visitors. When asked about inflation, Mr. Botvinnik responded that he had seen a local news item on the Internet that very morning that reported inflation in Krivoi Rog at 14 percent. However, he knew from his own professional and personal experience that the local inflation rate was much higher. For example, the hesed kitchen staff (who prepare meals for day center clients) tell him that the cost of food has risen 30 to 40 percent in the last few months. People cannot afford to pay for cataract surgery or chemotherapy, said Mr. Botvinnik. Hospitals do not have certain basic medicines, he continued. Parents of school-age children cannot afford to feed their children and help their own elderly parents at the same time. Public schools demand "contributions" from parents for school repairs, and parents can no longer afford to give their children a monetary allowance. Seniors fear that the Ukrainian government, facing major economic difficulties, will enact pension "reforms" that will reduce pensions. Obviously, Mr. Botvinnik said, the stress level in the community is very high. Russian intervention has aggravated an already dire economic situation. Local Jews, Mr. Botvinnik continued, understand that JDC is unable to provide all of the support that they need, and they are very grateful for any assistance at all. 57. 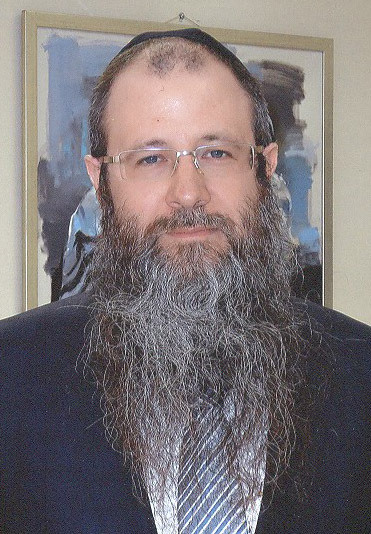 Rabbi Liron Edri, a Chabad rabbi from Israel, arrived in the city in 2001 to provide leadership for a Jewish population that lacked effective indigenous Jewish leaders. He has worked well with local government officials to obtain land for a synagogue and for a Jewish day school. He has secured funds for new buildings from individuals with Krivoi Rog roots who no longer live in the city. Rabbi Liron Edri has worked with donors to build structures that now exceed the capacity of the shrinking Jewish community to maintain them. He worries about the future for Jews in a rust belt city with a declining economy. 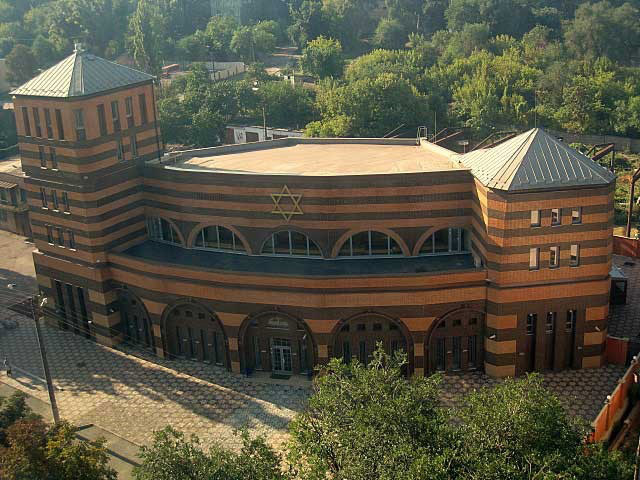 The synagogue, which was completed in 2010, includes a prayer hall, classrooms, conference rooms, a kitchen and kosher dining facility, a Judaica store, a welfare service, and a small Jewish Agency office. The welfare office, which is separate from the JDC hesed, dispenses food parcels, clothing, and some cash payments to needy individuals. A Jewish war veterans group meets in the facility, and a Jewish history museum occupies a room on the second floor. (See pages 77-78.) The syna-gogue also displays the work of con-temporary Jewish artists, some of whom have been able to attract purchasers through this exposure. The synagogue in Krivoi Rog is a striking building located on a major street close to the Chabad day school. http://www.godaven.com/detail.asp?Id=17493&C ountry=Ukraine. Retrieved August 26, 2013. As he has done in the past, Rabbi Edri expressed concern about the ability of the Jewish community in Krivoi Rog to sustain itself in a declining economy and an era of emigration. 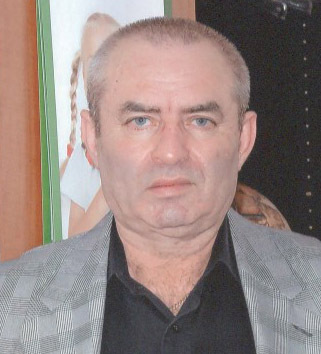 In ten years at the most, he predicted, possibly only five to seven years, only three Jewish population centers in Ukraine will survive as active Jewish communities: Kyiv, Dnipropetrovsk, and Odesa. Jewish young adults, he observed, are not staying in smaller cities and towns; assimilation also is taking its toll. Few local young Jews go on Taglit tours to Israel or participate in MASA Israel pro-grams, Rabbi Edri said, simply because there are few local Jews in the relevant age groups. These programs work best when a significant local cohort participates and creates a momentum that motivates others, he stated, but Krivoi Rog lacks the Jewish population mass to create such a force. Now the capital of independent Ukraine, Kyiv is the political hub of the country and an important center of Ukrainian commerce, industry, culture, and education. The city is known for its location on the Dnipr River, its historic buildings and monuments, and the Kreschatyk, the broad boulevard that is its main street. However, in April 2014, at the time of the writer's visit, the Kreschatyk remained closed to vehicular traffic; political protestors, as well as some homeless people, still maintained encampments from the earlier anti-Yanukhovich demonstrations. 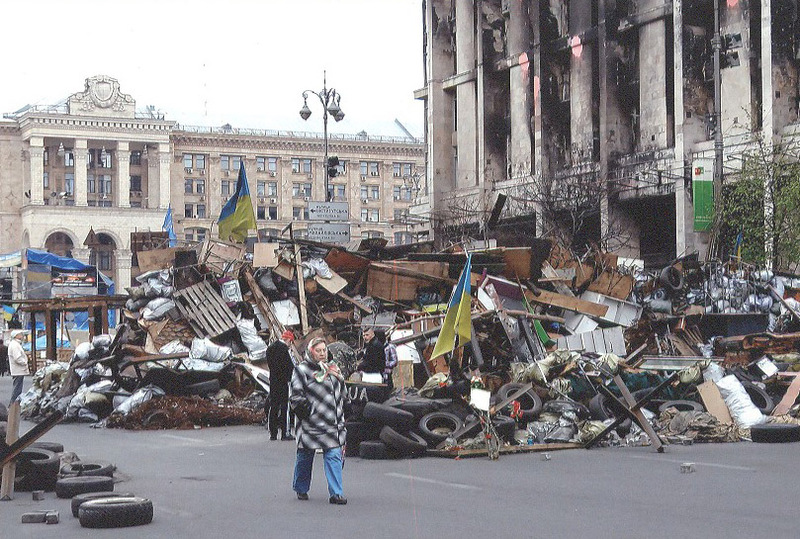 Barricades of old tires, some painted in Ukrainian blue and yellow, and protest detritus constituted an obstacle course for pedestrians. Large political placards, memorials to victims of police violence, and Ukrainian and European Union flags added to the color. A portable stage, its walls covered with political slogans, accommodated entertainers, especially on weekends when local demonstrators and spectators were joined by fellow protestors from out of town. On adjacent streets, one found additional protest sites and a medical dispensary tent complex staffed by volunteer physicians and nurses. Somewhat defiantly, most nearby businesses and other institutions remained open, vehicular traffic diverted when necessary, but pedestrians going about their business as if in normal conditions. At left, woman walks down the Kreschatyk, which is blocked to vehicular traffic, early on a week-day morning in April. The burned-out building is the former trade union building, which had been partly occupied by protesters as their headquarters, press center, security center, and kitchen; Kyiv police occupied other parts of the structure and are believed to have set the fire in an attempt to rout the protesters on the night of February 18-19. At right is a makeshift theater in the middle of the Kreschatyk; blue and yellow banners above and below the stage urge people to enlist in the new national guard. 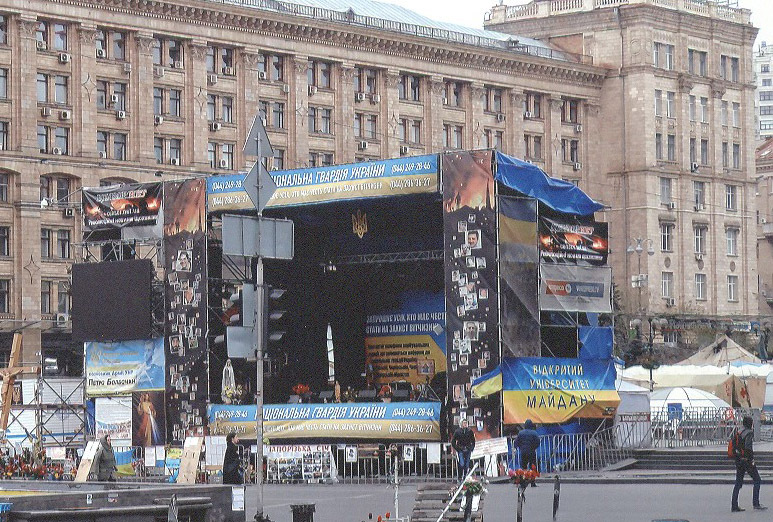 A banner on the side of the stage advertises an "open university of Maidan." The general population of Kyiv includes somewhat more than 2.8 million permanent residents and unregistered migrants. Although the number of the latter has increased in recent months as people flee violence in the east, the city always has hosted seekers from less well developed parts of the country as well as foreigners who have overstayed visas and lack the means to move elsewhere. Estimates of the size of the Jewish population of Kyiv range from 25,000 to 70,000. Unlike many other large Jewish population centers in the post-Soviet states, Kyiv lacks unambiguous Jewish leadership. The chief rabbi of Kyiv and Ukraine, Rabbi Yaakov Dov Bleich, frequently is absent from the city, and no other individual has emerged as a credible leader of Kyiv Jewry. The majority of Kyiv Jews remain aloof from organized Jewish activity. The dispersion of small numbers of Jews in villages is, in part, a legacy of Agro-Joint collective farms established in the area between the two World Wars and then broken up under Stalin. Many displaced Jewish farmers moved to cities after the farms collapsed, but some remained in rural areas. Many, perhaps most, hospitals in Ukraine (and Russia) expect patients to provide their own medicines and surgical tools. They also are expected to bring their own linens and arrange for food service. Many heseds and rabbis help patients with these items; for example, some heseds maintain a supply of bed linens and will bring food to the hospital if a patient lacks family members to prepare meals. Adopt-a-Bubbe (pages 40-42) and some heseds also attempt to provide medicines, surgical instruments, and other supplies in the hope that this largesse will lead to more acceptable treatment for their clients. Rabbi Shmuel Kaminezki of Dnipropetrovsk was instrumental in helping Rabbi Edri locate some of these donors.